SAN LUIS OBISPO — At mission control, what had been projected as “seven minutes of terror” was actually a bit of an understatement, a Cal Poly graduate said, after he and his fellow NASA team members nervously monitored a robotic lander’s nail-biting descent to Mars. The Nov. 26 touchdown of the lander, known as InSight (Interior Exploration using Seismic Investigations, Geodesy and Heat Transport), captivated audiences worldwide and marked the latest significant step in a renewed era of space exploration. Weise is one of three Cal Poly Engineering graduates who are playing a key role in that reinvigorated U.S. space presence. Tory Bruno is the CEO of United Launch Alliance (ULA), a launch provider that will send American astronauts in space; and Victor Glover is an elite NASA astronaut who will be sent out of this world this spring by ULA’s chief competitor, Space X. InSight is especially interesting, because it will study the interior of Mars and, NASA says, will provide valuable science as the agency prepares to send astronauts to the moon and the red planet. Glover said it won’t be long before humans travel beyond the moon. Humans have not launched into space from American soil since 2011, so the upcoming trips represent a major comeback for U.S. space exploration. Glover will play a vital role. Returning to the moon, Bruno told a packed crowd at Cal Poly’s Advance Technology Lab, is just one small step in the upcoming space journey. While Bruno was a rocket scientist for 10 years, he said he became a CEO to have a wider impact. Yet, he admitted, he’s still jealous of Glover on one thing: “He’s going to space!” Bruno said. Both Bruno and Glover were recently named 2018 honored alumni at Cal Poly. Glover will travel to the International Space Station, where he will live for six months. ULA rockets will also send astronauts to the station. While those four trips will generate international news, InSight’s landing — the first on the red planet since the rover Curiosity landed in August 2012 — whetted the public’s appetite and proved in dramatic fashion that space exploration is back. As deputy mission manager of InSight, Weise helped ensure that all of the flight teams, as well as the ground software needed, were ready for operations. InSight launched May 5 from Vandenberg Air Force Base. Riding along were two CubeSats — or mini satellites the size of briefcases — that were tested and packaged for launch in Cal Poly’s Advanced Technology Lab. After an 11-month, 300-million-mile journey from Earth, InSight was ready to land near Mars’ equator Nov. 26. News of the upcoming touchdown — and the hazards involved — created a buzz, fueled by the projections that the landing would represent “seven minutes of terror,” with a devastating crash being a real possibility. Two hours prior to the landing, he was in the mission control room at NASA’s Jet Propulsion Lab in Pasadena, Calif., wearing the maroon InSight shirt the team was seen wearing on live streams across the nation. There were no cameras on Mars to record the landing live, so the team had to listen for radio signals, which came in 8-minute delays. Applause followed when the team learned InSight’s parachute deployed and again when it locked onto the ground with radar. As team members stared at their computer consoles, a flight controller announced altitude measurements over an intercom — and the real tension began. 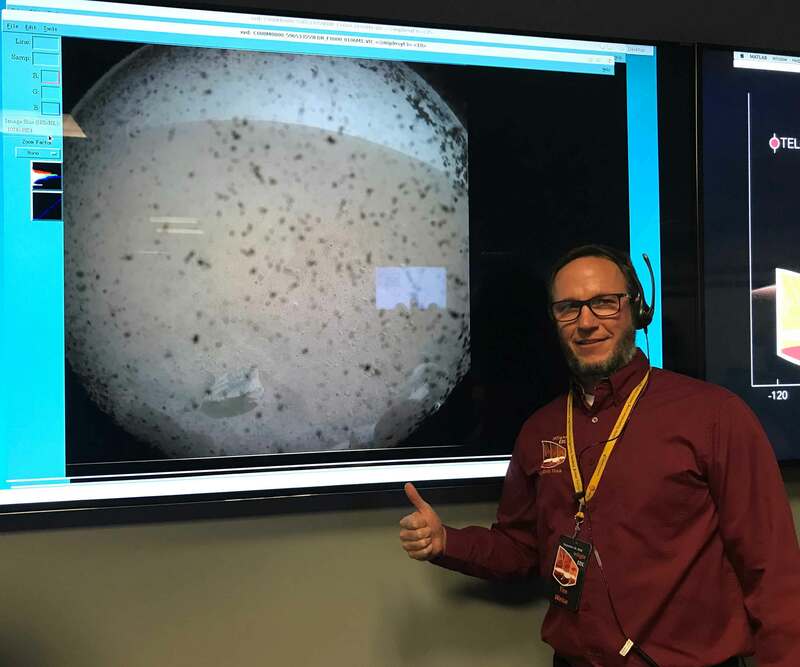 Weise.jpg: Standing near an image projected by NASA’s lander, named InSight, Cal Poly alumnus Tim Weise gives a thumbs up at mission control 15 minutes after InSight’s dramatic Mars touchdown. 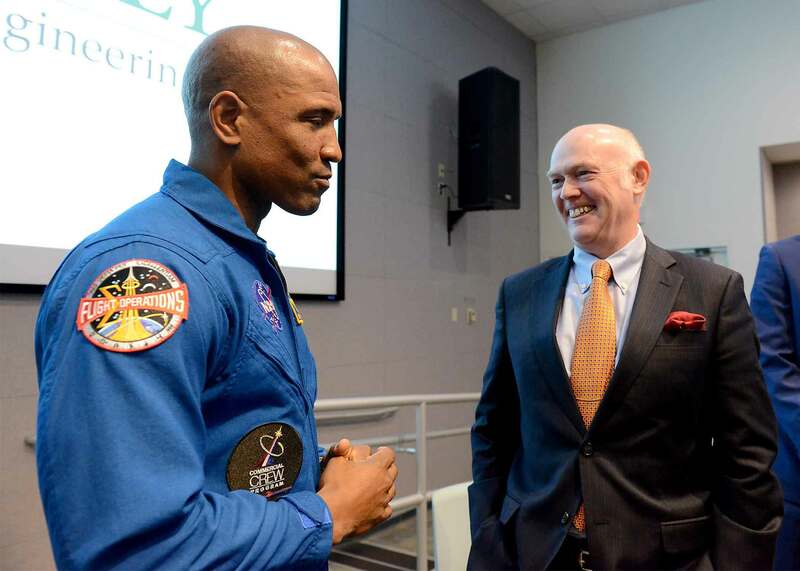 Glover-Bruno.jpg: NASA astronaut Victor Glover and United Launch Alliance CEO Tory Bruno chat during a recent trip to Cal Poly, which named them 2018 Honored Alumni. High-resolution versions available upon request.